Paul Smith is one of Britain’s most iconic fashion brands, with stores located in cities all over the world. To help make their online e-commerce experience as slick as the physical, I’ve been working with their internal team to tackle key user experience challenges and establish and evolve their existing visual language. 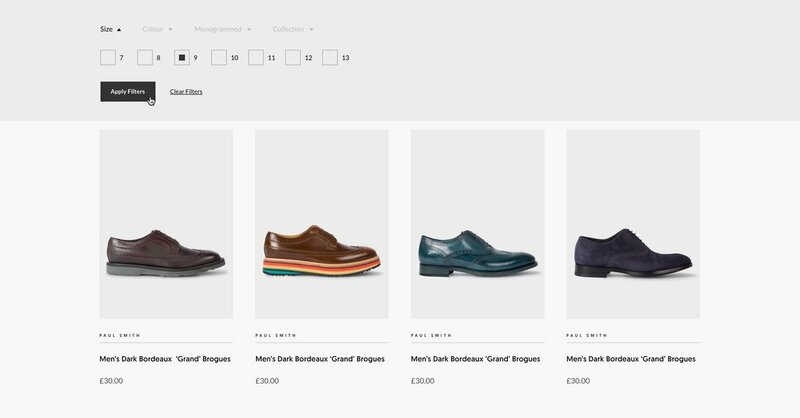 Campaigns and Stories are central to the Paul Smith website – not only as routes to new product lines, but also as a means for people to explore wider context for the variety of collaborations that the company are involved in. As each story is different, I created a range of flexible, modular layouts that could be put together in various ways to serve the content. One of the broader challenges that we tackled revolved around product filters, and how we could enhance the usability of this function to make searching through large categories a breeze. Our initial research found that the filter implementation was difficult to use, only allowed for one-by-one category selection and generally went against intuition. To improve this, we introduced the ability to select multiple options across several categories without needing to refresh the page, along with a new visual approach, meaning people could filter everything they needed in one swift action. As part of our ongoing project to unify and introduce new visual elements, the team also asked me to create an icon pack for use across the website and email campaigns. There’s more exciting improvements and developments in the pipeline, many of which I can’t show right now, but here’s some additional interface elements which I’ve created with the team as part of the ongoing evolution of the visual language.